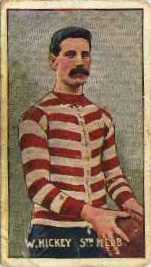 Hickey represented Carlton in a single game of footy in Season 1907. His only game was a defeat by St Kilda at Princes Park by 26 points. He had started his career South Melbourne in 1902 where he had played 45 games and scored 1 goal. He was originally recruited from Wangaratta. Contributors to this page: pblue , tmd1 , molsey , Jarusa , dgreen2 , WillowBlue , buzzaaaah and admin . Page last modified on Tuesday 02 of October, 2012 03:36:48 AEST by pblue. 1980 GF Half Time Sprint - Carlton's Peter Francis.